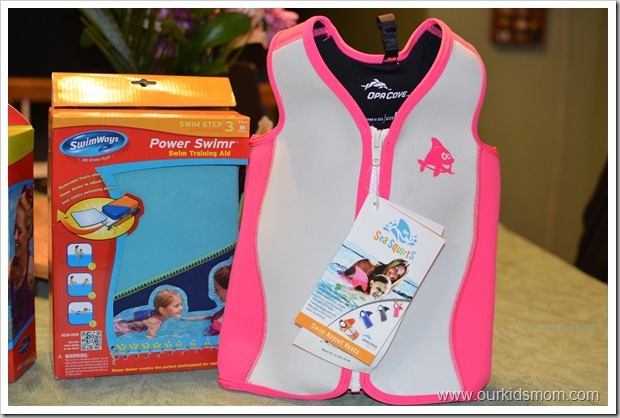 As a member of the Swimways Swim Step Swim Team, Emma and Ethan received a couple of products to review from the “step”. At the beginning of the summer Ethan was uncertain in the water and so I chose Step 2 for him. Swim Step 2 products are designed to provide just the right amount of support and comfort to your budding little swimmer as they learn to balance and paddle, important pre-swimming skills. In addition to mom or dad being right by their side, our swim training aids can help your toddler get ready for swimming lessons. Swim Step 2 products include the Swim Sweater, Swim Vest, and Swim Shorty. Emma was comfortable in the water and was ready for a little more freedom to explore and learn. I chose Step 3 for her. As kids get older, they’re ready to begin truly learning to swim. They’ve mastered water balancing and paddling and they may already have some other swimming skills. Swim Step 3, our Power Swimr Swim Training System, is perfect for kids at this stage – it’s just like training wheels for the water! Graduated flotation gives you the tools to progress your child’s swimming ability at his or her own pace. Emma started with the Power Swimr swim training aid. I was hoping she would like this one as I loved the concept of a graduated flotation device that allowed her to advance at her pace. There are hidden pockets inside the front and pack that keep 9 removable pads secure. As your child’s confidence and ability advance you remove a pad at a time until they are swimming entirely on their own. The adjustable cords on each side help create a snug fit and there is a strap that comes up between the child’s legs. Emma feels confident and hasn’t once worried about it falling off. Ethan started with the Swim Vest. Although the size Swimways sent was correct, this fit Ethan very large and did not give him the confidence and support he was looking for in the water. I think he wore it about 5 minutes before asking to take it off. The design was a good one, but I think the sizing was off and he felt insecure with it being so big. The second vest Emma tried was the Sea Squirts Swim Assist vest. As you can see, it has an adorable little shark fin on the back which makes it attractive to the kids. The Buoyancy Technology helps kids achieve the correct position in the water giving them great control and stability when swimming. 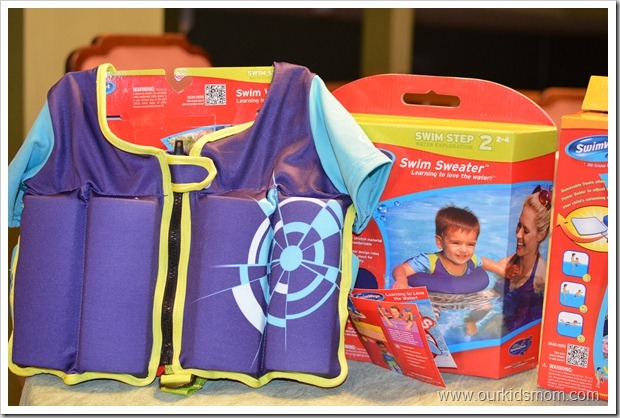 There are three removable panels that allow the parents to adjust the vest as children progress in the swimming abilities. The vest is available in orca, blue dolphin, pink dolphin and clown fish. This was a good quality item, but Emma seemed to grow out of it very quickly. The sizing is spot on and when she gained just two pounds I couldn’t get it zipped. I would suggest sizing up if you are on the borderline for weight. Emma didn’t feel quite as confident when wearing this vest, but her abilities were refined yet and although it does offer support, it is more for children near the cusp of swimming on their own. Ethan is sporting the Swim Sweater. This is a very stable, circular torso design that rides high on the child’s chest for extra stability. The sun sleeves add extra sun protection and give an adorable farmers tan ;). This was Ethan’s favorite flotation device for most of the summer season. He went from hanging onto me for dear life to jumping in the deep end and swimming across the pool on his own with the Swim Sweater. We had two minor issues with it, though. Ethan has a rather large head so we had to force the tub over his head. This could be viewed as a plus as he cannot take it off on his own and it cannot slide off. The other issue was the shirt was a bit short bodied. Ethan kept pulling it down and you can see in the second photo the neckline started stretching downward because of the tugging. It is only available in one size, so we dealt with the issues because he loved it so much. 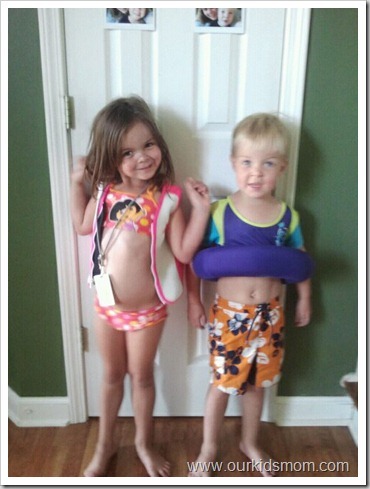 Swimways has helped my two considerably this summer on their road to independent swimming. 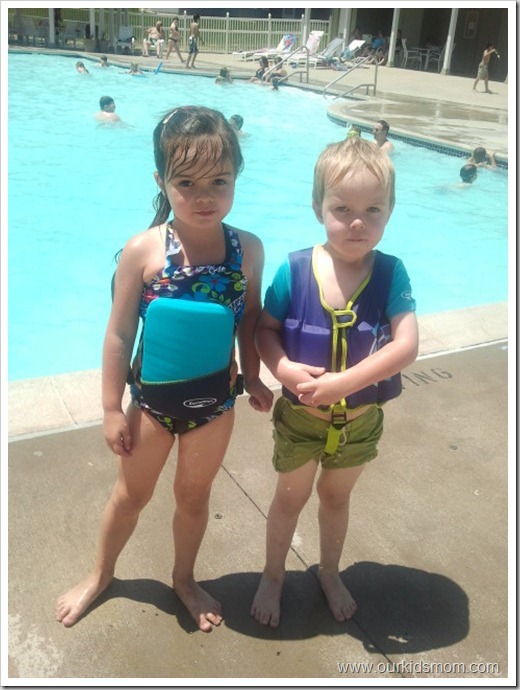 I am proud to say that both Emma and Ethan can and do swim on their own with supervision, but still wear Swimways Power Swimr’s when they just want to float and have fun. If you are looking for a tried and true product that will help your children advance to independent swimmers, check out the Swimways Step Program! super cute!! they look like they are loving those swim trainers!! My boys had these when they first were learning to swim! 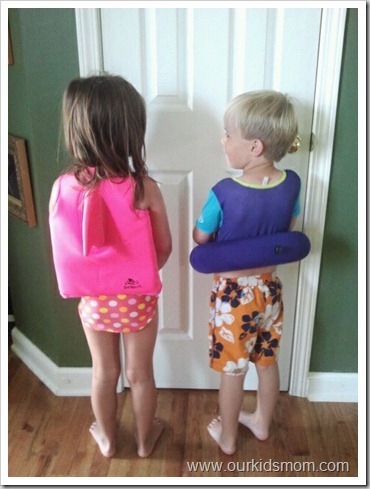 My mother in law bought them for the boys to use when they went to swim in her pool…which is now our pool! They work really well to remove a lot of the fear, which is the largest deterrent in learning to swim! My mom has a pool so swimming aids are a must in our house and I am always looking for new solutions as my kids don’t want to use the same ‘toys’ all the time. These all look great and super easy to use, thanks for the info! Wow I love the vests in the top two pics, those look like they really work well. Having those on my daughter would make me feel so much more comfortable with her in the water. Your two look really cute, I love the shark fin haha. LOL they are just so cute! You are one lucky momma! Great swimming apparel. I love the swim sweater. That seems like what the grandkids would like best until they learn to swim. Thank you for introducing the other products that I have not heard about. My daughter will be 8 next summer and still can’t swim, is kind of scared of the water, this would be great!